Inherent within Symphonity's name is simple clue to their style of metal: symphonic, bombastic, powerful and simply larger than life. This band from the Czech Republic (formerly called Nemesis) delivers no-holds-barred epic power metal on their second release 'Voice From The Silence.' With this auspicious start they sound like seasoned veterans. Indeed, Symphonity is helped along by Sascha Paeth (Edguy, Angra, Rhapsody of Fire, et al) who brings a crisp and fluid mix to the production. 'Voice From The Silence' flips back and forth between basic power and melodic metal with the two basically intersecting throughout. The song composition, though typical of both genres, is brilliant and more cohesive than most power metal going these days. While the musicianship is strong from beginning to end, journeyman vocalist Olaf Hayer (Luca Turilli, Fairyland, Dionysus, Magic Kingdom) seems a bit muted and lethargic at times, but generally rises to the occasion (most notably on 'Evening Star'). For my money, it's keyboardist Ivo Hofmann who steals the show on this disc. His presence is foundational adding a creative texture to the proceedings. As for the work itself, a dividing line can be drawn between the fifth and sixth songs. Skipping the opening instrumental introduction, the first half is basic, yet well composed and performed, power metal with speed and melodic intensity. It's all good, but could also be easily overlooked. The second half of the album is where the true inspiration lies. 'The Silence' trilogy gives reason to love epic power metal all over again. 'Searching You' with it's memorable melody and catchy chorus is easily the best and most powerful song on the whole work. Then Symphonity finishes well with two numbers, 'Evening Star' and, excepting the brief instrumental, the bonus 'hidden' track,' which reveal more progressive nuances than is found on earlier songs. Of these, 'Evening Star' is most impressive and complete. 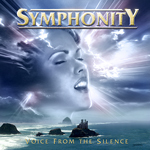 Overall, Symphonity's 'Voice From The Silence' delivers melodic and epic power metal with imagination at an often breathless pace. I was quite entertained and satisfied. However, I fear that either their unique creativity will go unnoticed within this overpopulated genre or (in part, because of this) they will fall into power metal mediocrity in the future. I hope neither is their fate! Recommended! Symphonity delivers melodic and epic power metal with imagination at an often breathless pace. I was quite entertained and satisfied. However, I fear that either their unique creativity will go unnoticed within this overpopulated genre or (in part, because of this) they will fall into power metal mediocrity in the future. I hope neither is their fate!